The Canadian Aviation Historical Society (CAHS) will be holding its AGM from May 30 to June 3, 2018 in Calgary, Alberta. Below is a list of scheduled speakers. 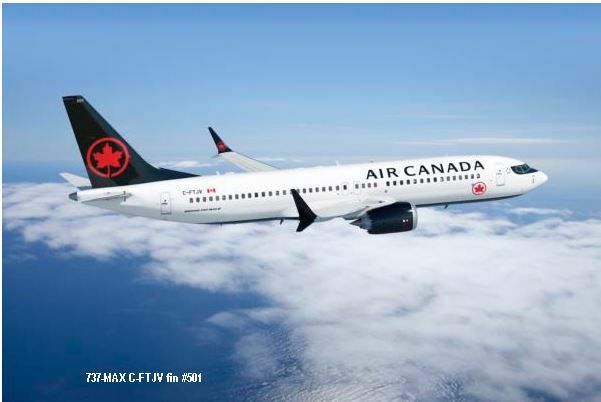 Starting October 2018, Air Canada will whisk you away to fun in the sun on its new Boeing 737 MAX fleet. In addition, from December 2018 to April 2019, the YVR-LIH route will offer a three-times weekly service. Lihue is the second largest town on the Hawaiian Island of Kauai, which is known as a cultural and historical getaway. The Boeing 737 MAX uses 20 per cent less fuel per seat than the original Next-generation 737. Air Canada has configured the cabin to include North American Business and Economy class seats. 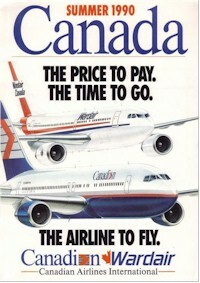 For more information, visit www.aircanada.com. Switching paper for Styrofoam cups seems like a small thing, but when you serve 180,000 cups a day, it makes for big reductions in hard-to-dispose-of polystyrene waste. This is one example of Air Canada’s efforts to be environmentally responsible – efforts recognized recently when Air Transport World named us Eco-Airline of the Year for 2018, global recognition that we are very proud of. (Excerpt from “enroute” magazine March 2018 "Eco friendly skies" by Calin Rovinescu, President and CEO). I also have a few pins I've collected over the years. Just not Air Canada & TCA but other airlines as well. The second smaller collection includes a TCA captain’s hat badge and a 1st officer’s hat badge thanks to Don Wood YVR. 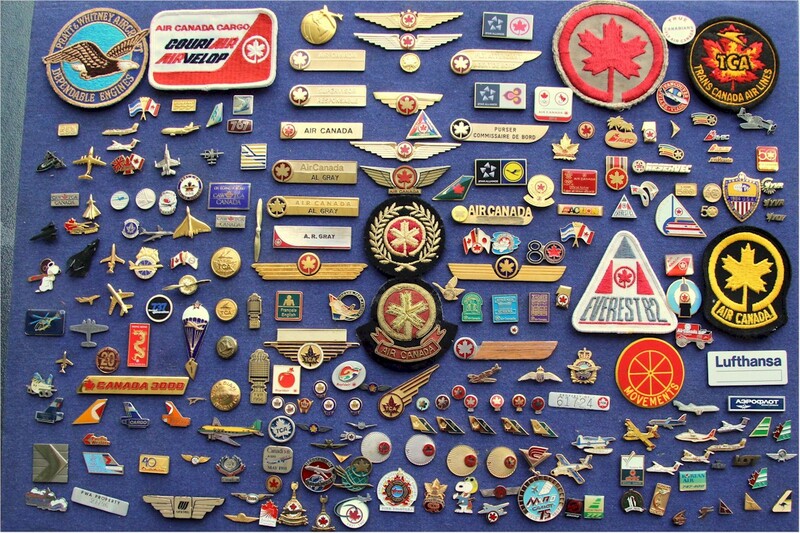 Allan sent us some of his duplicate pins which we scanned and have shown here. 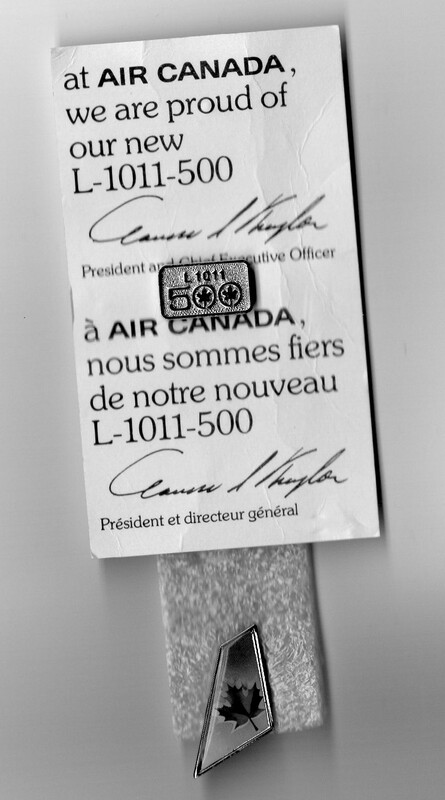 I had the pleasure of flying on the new AC L-1011-500 and they gave us a pin on the inaugural flight. It is in a plastic cover with some text and signed By Claude Taylor. I think it was 1973, the route was from YVR-LHR. I was a supervisor with CPAL then (god that was long ago) and a manager from AC invited me. Included with the L1011 pin was a tail pin from Gerry. 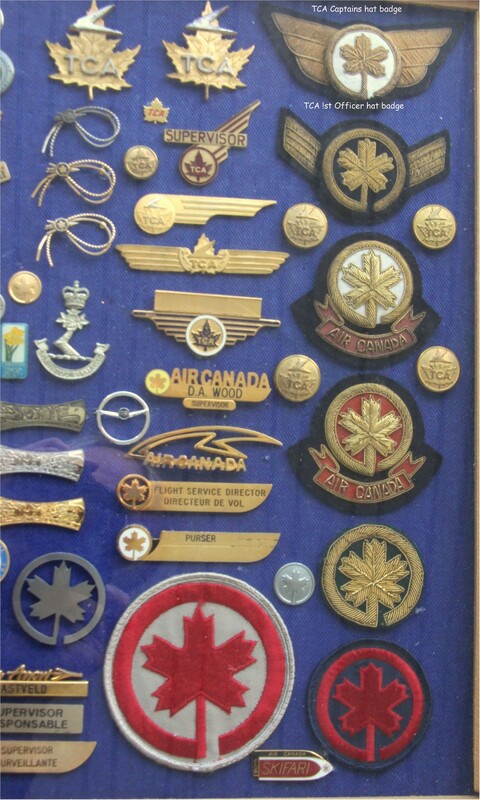 I was with CP from 1967 - 1987, left and went to work for Air New Zealand at YVR 1989-2001. NZ closed the base (Sept 11 and all). NZ returned service in 2007 and I went back to work for them until 2009, between summer contract work. It was 40 years, and time to go. 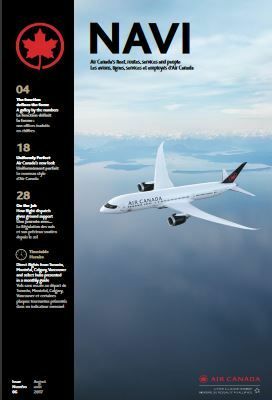 Air Canada NAVI magazine was launched in March 2017. On the left we have the issue for August, 2017 cover page. Below is a photo of the crew. Front row: Marion Shay, Angela Mah, Bonnie Walker, Alanna Kathleen Chan, Janette Dramstad, Candice Widdington and Amrik Bening. Middle row: Jayne Willis, Tertius Serfontein, Lorna Holmes, Kevin Howlett, Bill Devlin, Shielane Khera, Valinda Leitner, Jeff Feldman and John Oneill. Back row: Andrew Moore, Taylor Shaw, Mark Gordonsmith, Glynne Wilson, Anna McMurdo, Herman Yee, Kaila Henly, Charanjit Brar, Patrick Holler and Dana Konings. 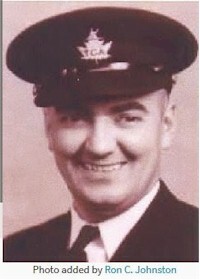 In April of 1939 he joined Trans-Canada Air Lines. He started in the airline as a First Officer but by September of 1939 he and Jack Crosby were teamed up for promotion. In March 1940 they were both promoted. In his first years as Captain Steve flew the prairies as far west as Lethbridge and, on occasion, Winnipeg east as far as Montreal. In 1944 he got a place on the CGTAS but before he could take a flight he was asked to return to Winnipeg to run the flying school. He used to spend his holidays flying in the bush for Lamb Airways and, in fact, this is how he started his son, Jeff, in the flying business. In 1943, on his days off in Winnipeg, Steve would instruct for the Company. In one month he logged 175 hours. From 1944 until his retirement in 1969, Steve flew the Atlantic for TCA and then Air Canada flying Avro Lancastrian, North Star, Lockheed Super Constellation, and Douglas DC-8 aircraft. He only had one orientation flight to Prestwick, Scotland, and back to Montreal before taking over as Captain. Click Here for a full history of Steve has been put together by Ron C. Johnston. 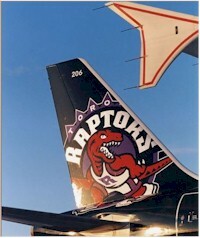 Air Canada became the official airline of the Toronto Raptors in 1996. It took Toronto's 23-person paint crew seven days of round-the-clock shifts and some 45 gallons of paint and primer to get the Raptor just right. Aircraft painter Dennis Chislett admits: The hardest part to get right was the Raptor's teeth and claws on the plane's tail." Here we have these photos of the Raptor paint scheme in 1996 on C-FDSN fin #206 c/n 0126. Found in the "Between Ourselves" issue dated October 1963. First jet freight service for Canada inaugurated by company coast to coast. On October 28, 1963 this service was inaugurated with DC-8F Jet Traders capable of carrying up to 45,000 pounds of cargo providing service between Montreal, Toronto, Winnipeg, Edmonton and Vancouver five week days a week. The DC-8F had mixed freight/passenger configuration. Found in the "Horizons" magazine issue dated April 1983. Dusseldorf rejoined the Air Canada route on April 24, 1983 after an absence of 17 years. Pacific Southwest Airlines plans purchase of four DC-9-32 from Air Canada. The cost of each aircraft is approximately USD $6 million. Three of the aircraft had been sold to Philadelphia-based Altair Airlines in July 1982, three had been delivered before Altair ceased operations and the aircraft were repossessed, in November 1982. The fourth aircraft was not delivered to Altair. All four of the aircraft were then sold to PSA. CF-TLI fin #708 c/n 45846 sold to Altair Airlines July 16, 1982 repossessed, then sold PSA 27 April 1983. CF-TLK fin #710 c/n 47020 sold to Altair Airlines July 28, 1982 repossessed, then sold PSA 27 April 1983. CF-TLP fin #715 c/n 47068 sold to Altair Airlines July 16, 1982 repossessed, then sold PSA 25 May 1983. CF-TLN fin #713 c/n 47023 sold to Altair Airlines not taken up, sold to PSA July 1, 1983. 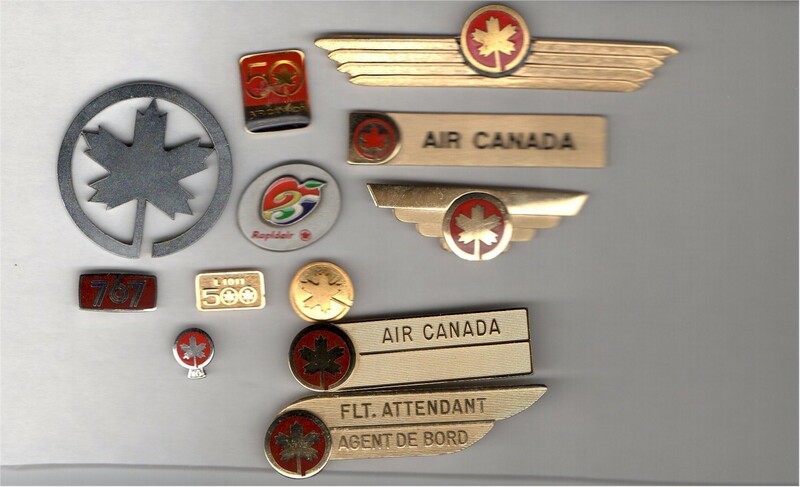 There is a small plaque located on one wall of the District Sales Office in San Francisco that in many respects symbolizes the station's continuing dedication and energy as it seeks to enlarge Air Canada's presence in an area dominated by massive and intense competition. Emerson Richards, Sales Rep; Bruce Hembroff, Passenger Sales Manager and Vic Leonard District Manager discussing product promotion plans. The delivery of the company's fourth 767 on March 31, 1983 was a milestone in the airline's history. 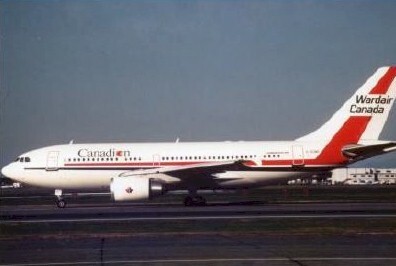 The aircraft was the 50th Boeing airplane purchased by Air Canada. ln honour of the occasion, Richard W. Welch, President of the Boeing Commercial Airplane Company in Seattle, sent the following message to President Claude Taylor. 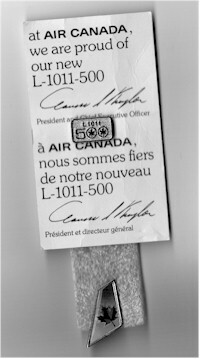 "Today, Air Canada took delivery of its fiftieth Boeing jetliner. Beginning in 1971, seven B747's, thirty-nine B727-200's and, as of today, four B767's have left our factories painted in the Air Canada livery. I wish to acknowledge Air Canada's contribution to the success of these three programs and to offer my personal thanks to you and your employees for the confidence in our products that you have demonstrated." From the YUL "Parts and Pieces" magazine issue dated May 1990. Since we do not often get to see the guys on the midnight crew, we thought that we would run a picture of the energetic group. 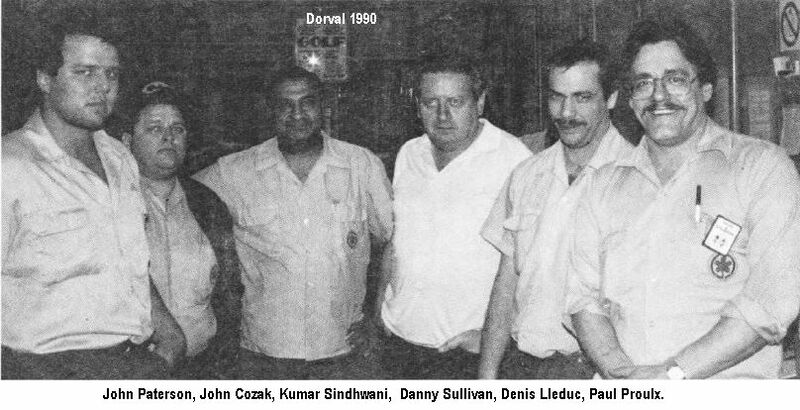 (Left to Right): John Paterson, John Cozak, Kumar Sindhwani, Danny Sullivan, Denis Leduc and Paul Proulx. 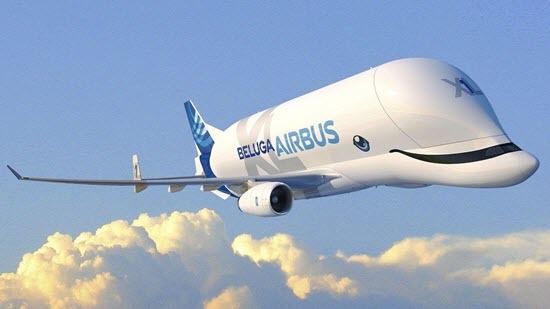 The Airbus BelugaXL is a large transport aircraft under construction and due to enter into service in 2019. The XL has an extension on the fuselage top like the Beluga. It is being designed, built and will be operated by Airbus to move oversized aircraft components. The aircraft is 63.1 m long, 18.8 m high, with a fuselage diameter of 8.8 m. The BelugaXL can carry a maximum payload of 52 metric tonnes nonstop over a range of 4,074 km/2,200 nm. The BelugaXL can transport two A350 XWB wings while the BelugaST could only transport one. Click on image below for more information. 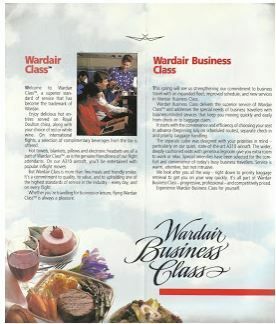 Extracted from airline-memorabilia.blogspot.ca regarding the merger of Wardair and Canadian Airlines International in 1990. Canadian Wardair is, in fact, two airlines in one. It has been formed by the merger with Canadian, or to give it its full name, Canadian Airlines International with Wardair. You can be forgiven if you've not heard of Canadian. It had never provided scheduled service to the United Kingdom before under that name. By contrast, Wardair needs no introduction. Not only has it served Britain for some time, but its reputation for service seems to have reached every corner of the globe. From this merger, we've emerged. And we look forward to giving you an ever better service. Every week, from April 1990, we'll have 20 flights from Gatwick serving Toronto, Ottawa, Calgary, Edmonton and Vancouver. These flights include the Toronto Starliner, which gets you from London to Toronto the same evening. And the London Dayliner, which gets you from Toronto to London the same day. There are also three non-stop flights from Manchester to Toronto each week. With our partners, we serve more destinations in Canada than any other airline. In fact, we offer 900 departures throughout the country, every day. As well as new aircraft, we offer new standards of service. Indeed our economy service makes a mockery of the term. You'll enjoy good, nutritious food, elegantly served, with a selection of complimentary drinks and wines, and a choice of desserts and liqueurs. Also, with our compliments are personal headsets, current films and the latest magazines. Our business class is equally outstanding. You'll sit by a window or an aisle in a wide, deeply cushioned seat, with ample leg room and adjustable foot rest. You'll find the cabin spacious, well-appointed and pleasing to the eye. The delicious food is tastefully presented on china crockery, with linen napery and fine wine served by friendly, courteous and efficient staff. There are other touches for business class passengers. Like advance seat selection, dedicated check-in counters and priority baggage handling. 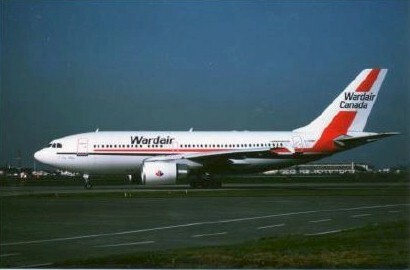 Wardair was purchased in 1989 and the 12 Wardair A310s were briefly brought under the Canadian umbrella before being disposed of. 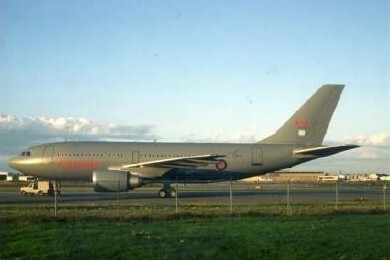 Five of the A310s moved to the Canadian Forces. When I began my airline career in YYZ back in 1980, Las Vegas was high on my list of places to visit. However, at the time, Air Canada did not fly scheduled flights directly from YYZ to LAS. Charter service was available twice a week (Thursday and Sunday) using B-747 Classics in 496 seat all economy configuration. There was still a strict dress code in effect and male cons had to wear jackets and ties. To say the least, it was difficult to be inconspicuous on a flight full of vacationers casually dressed on their way to a “Sun” destination. There was no registration nor a way to pre-check flight loads at the time so showing up at the airport hoping for a seat was like pulling on the arm of a slot machine. The back up plan was to buy OAL tickets on a couple of airlines from LAX to LAS in case it was necessary to hop on the YYZ-LAX flight that left a few hours after the direct charter. America West was the best bet of the OAL’s because LAS was one of their hubs and they flew almost hourly right up until 01:00. I realized that they were doing things differently on my first flight with them. This was before the proliferation of low-cost airlines and the industry turbulence that was shortly to follow. They were one of the first airlines to employ “cross-utilization” of staff and when I arrived bleary eyed at the gate hoping for a seat on their last flight of the evening; I was greeted by a young man dressed as a baggage handler who happily checked me in, assigned me a seat and then tagged my bag and departed down the stairs to load it on the aircraft. As I walked down the gateway to board the aircraft, the female gate agent who had been working with the young man followed me onto the aircraft and picked up the microphone to begin the pre-flight announcements. What just happened! All the workers in this company seemed to like their jobs! I was to learn later that all America West employees were required to purchase company stock and as such, considered themselves to be owners of the company; a concept that we would hear much more about in later years in Canada. 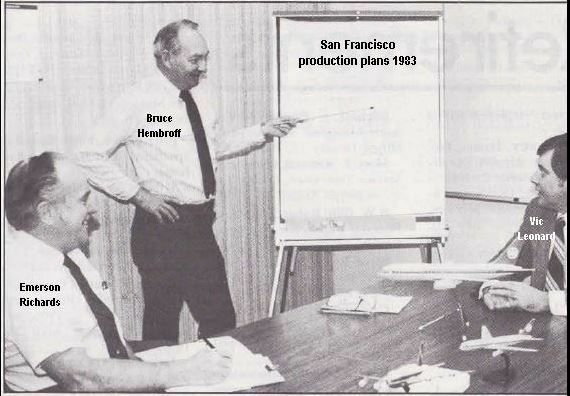 The formula worked as America West continued growth for the rest of the eighties but the company’s own ambitions and world events in the next decade changed things abruptly and the company operated under bankruptcy protection from 1991 to 1994. 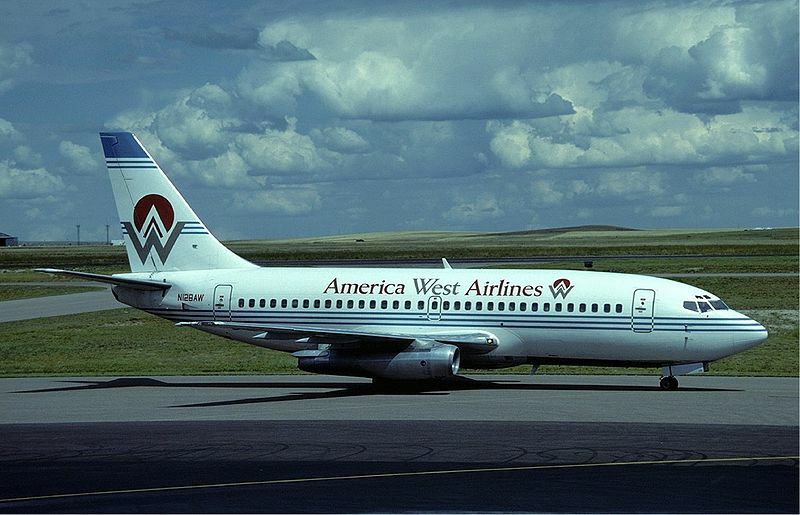 America West would emerge from bankruptcy in 1994 with investments from Mesa and Continental Airlines (Air Canada had made an investment in Continental around this time). When Air Canada and C.A.I.L merged in 2001, we had a contract to perform “C” checks on the America West B-737 fleet at the YVR Ops Centre. Registration N128AW (pictured) was originally delivered to Pacific Western Airlines (registration C-GBPW) and was leased to America West on several occasions before becoming a part of the Canadian Airlines fleet. 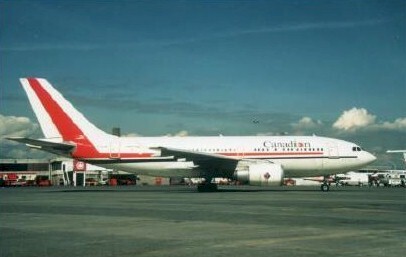 It was retired after the Air Canada/C.A.I.L. merger and submerged on the ocean floor off the coast of YVR where is has since served as an artificial reef for diver training. In 2005, US Airways was still in bankruptcy and, in a reverse merger, its operations were taken over by America West Holdings but it was the much larger US Airways brand that survived and America West livery slowly disappeared. US Airways would later merge with AMR in 2013 and, in turn, its livery was absorbed into the American Airlines brand by 2015. He was correct that I have an interest in, and have written about aviation. I had contacted him to inquire whether the Catalina’s itinerary would include YXS, but I have never worked at the airport there. I have been a resident of Prince George for 40 years this month, having previously worked for Air Canada in the 1970’s as Supervisor of Communications Software in Toronto. I was interested in your historical article about Harbour Air under ‘Odds and Ends’ in the same issue of Netletter. I happily flew with them many times in recent years between the YVR floatplane base and Victoria Harbour during a six-year tenure as a part-time board member with BC’s Forest Practices Board, sometimes in the right hand seat when the opportunity arose. Twelve days, 110 kilometres of rugged backpacking, two tense grizzly bear encounters, and several mountain ranges later, Murray made several tries in marginal weather before successfully picking us up at Buckley Lake just south of the Stikine River. If you’ve never flown at treetop height in the remote back country in a Beaver, it’s pretty exciting! I'm wondering if someone has a little bit of history about the 12 B767-200s that were purchased early in 1980s that they would be willing to share. I have been collecting aircraft parts related to Air Canada's B767-200s for some time and would enjoy reading some facts behind each of the aircraft. Here is a picture of the throttle quadrant from C-GAUU. I bought it. 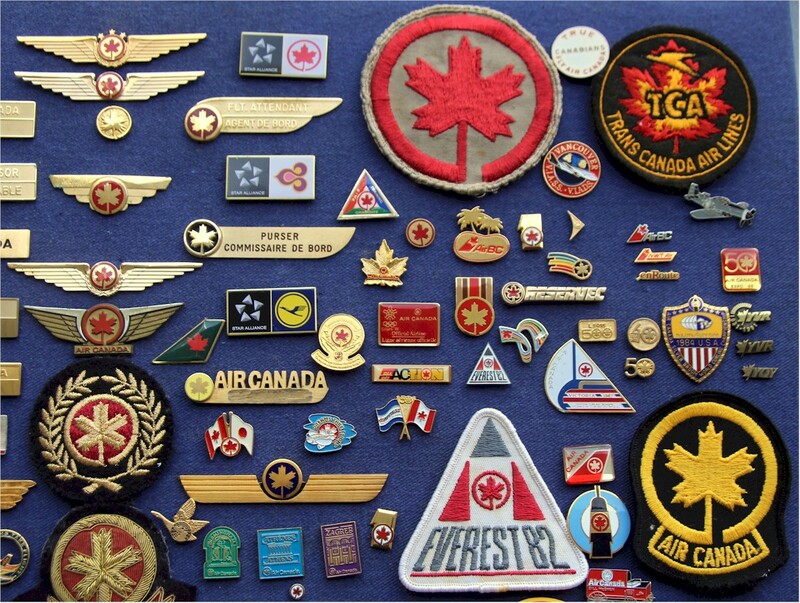 I am currently designing a book written by retired TCA/AC captain Jim Griffith paralleling his flight experiences with the history of TCA / Air Canada. Details will be in the NetLetter when available. Jim Griffith sends us a copy of the book cover. As a matter of interest, there are many aviation would be authors out there. 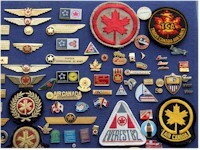 Canadian Aviator magazine is receiving submissions from writers who believe they have a story worth telling and publishing. This is not a self-publishing deal but a traditional publishing program. Click Here for a list of books that we have published. The B.C. Aviation Museum (BCAM) at Victoria, B.C. is making a bid to obtain the Avro Lancaster aircraft, FM104, presently owned by the City of Toronto. There are currently seven restored Lancasters in Canada - 5 in Ontario and 2 in Alberta - there are only 2 in the world that fly, including the one in Hamilton. BCAM is facing competition from Langley's Canadian Museum of Flight. The aircraft was built in Malton, Ont. in 1944. After the war ended, it was used for maritime patrols and search-and-rescues by the Royal Canadian Air Force. The bomber was retired in 1964 and displayed at Toronto’s Coronation Park, and, later, at the Canadian Air and Space Museum at Downsview Park. After WWII, Trans-Canada Air Lines received more than 20 Canadair DC-3 rebuilds. Here CF-TEG sits in its polished glory at Cartierville, ready for customer acceptance. "TEG" served TCA from 1945 - 1957, then Canada's Dept. of Transport as CF-GXW to 1985. In 1986 it flew around the world promoting Vancouver's Expo 86. In 2010 it was working with Algonquin Airways, and, in 2018, was listed as being owned by Lance Toland Ltd, Wilmington, Delaware, USA and registered as N173RD. Trans-Canada Air Lines, the publicly-owned trans-continental airway, plans to institute a 13-hour Vancouver-New York service by the spring of 1942, using the latest type of Boeing 307 Stratoliners. 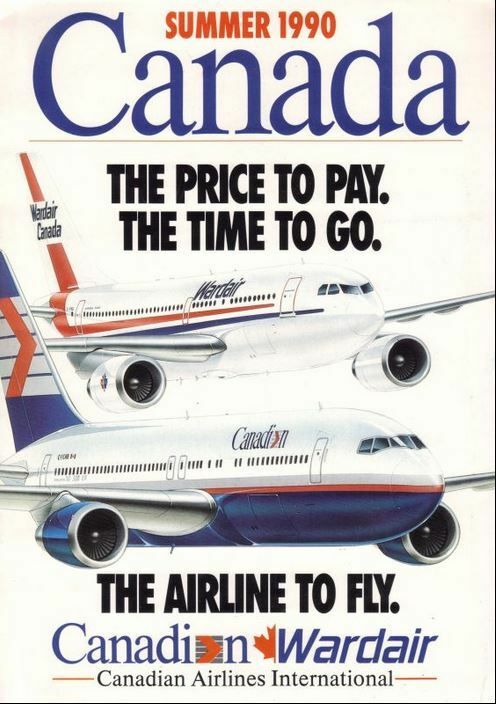 With such a service the Canadian airline would provide stiff competition to the present United States transcontinental services. The 33-passenger pressure-cabin Stratoliners have been selected because of the high altitude flying required at the western end of the trans-Canada route. Between Lethbridge, Alberta and Vancouver, the Canadian Rockies tower 12,000 feet and more, with the lowest pass, Crow's Nest, at 11,000 feet above sea level. During winter months planes have to operate above 12,000 feet and often go as high as 17,500 feet to miss storms. At present oxygen masks are provided or passengers and crews but the pressure cabin will eliminate this. It was the Boeing president, Philip G. Johnson, who put Trans-Canada Air Lines on its operating feet. The use of these planes is expected to make possible flights straight across the Great Lakes, instead of as at present circling the lakes to the north, thus eliminating some 350 miles from the trans-continental route. Favourable exchange due to the war is expected to play a part in bringing United States transcontinental business to the Canadian line. Sea Island Airport, Vancouver, B.C., with one of Trans-Canada Air Lines' Lockheed Fourteens and one of United Air Lines old Boeing 247D's on the tarmac. The cargo door of an Antonov AN-12, a Soviet-era cargo plane, loaded with nine metric tons of gold broke open as the plane took off from Yakutsk in East Siberia. 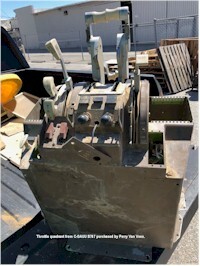 The aircraft's door apparently gave way and broke off due to the weight shifting in the cargo hold. 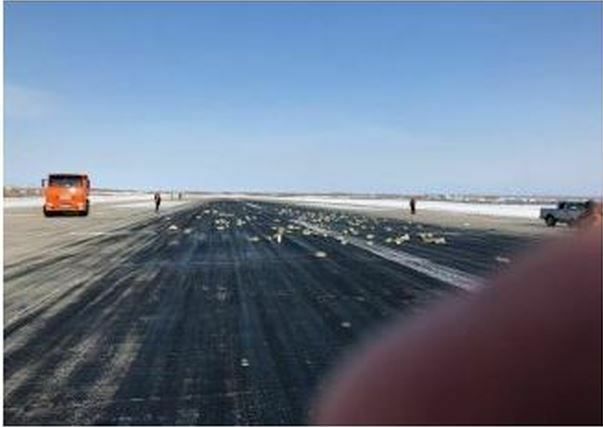 Gold alloy bars were then strewn across the runway and on the airport property. Qantas B787-9 flew the first ever non-stop airline route from Australia to Europe, travelling from Perth to London. The jet carried 236 passengers on the trip covering 7,775 nm in about 17 hours. When Qantas first established a route to London, the "Kangaroo Route" in 1947, it took 4 days and 6 stops. Qantas first flew the "Kangaroo Route" on 1 December 1947. A Lockheed Constellation carried 29 passengers and 11 crew from Sydney to London with stops in Darwin, Singapore, Calcutta, Karachi, Cairo, and Tripoli (passengers stayed overnight in Singapore and Cairo). Some of the many Dargal interline offerings. Lisbon; Leixoes (Porto); At Sea; St. Peter Port; Cherbourg; Honfleur; Ostend; Amsterdam; Greenwich. From: Inside: $1450, Oceanview: $1750, Balcony: $2150. Copenhagen; Aarhus; Skagen; Oslo; At Sea; Bremerhaven; Amsterdam; Amsterdam; Ostend; Honfleur; Greenwich. From: Inside: $1595, Oceanview: $1925, Balcony: $2365. Stockholm; Helsinki; St. Petersburg; Tallinn; At Sea; Copenhagen; Transit Kiel Canal; Amsterdam; Zeebrugge; Southampton. From: Inside: $1740, Oceanview: $2100, Balcony: $2580. Southampton; St. Peter Port; Cork; Dublin; Douglas; Belfast; Glasgow; At Sea; Kirkwall (Orkney Islands); Invergordon; Dundee; Leith (Edinburgh). From: Inside: $1885, Oceanview: $2275, Balcony: $2795. Leith (Edinburgh); At Sea; Bergen; Flam; Gudvangen; Geiranger; At Sea; Svolvaer; Cruise Trollfjord; Tromso; Honningsvag; At Sea; Olden; Haugesund; Skagen; Copenhagen. Budapest; Vienna; Grein; Linz; Vilshofen; From: Oceanview: $975. Basel; Breisach; Strasbourg; Mannheim; Koblenz; Cologne; Amsterdam; From: Oceanview: $975. Prague; Nuremberg; Regensburg; Passau; Melk; Vienna; Budapest; From: Oceanview: $1305, Balcony: $1725. Zurich; Strasbourg; Excursion to Heidelberg; Frankfurt; Karlstadt; Wurzburg; Kitzingen; Roth; Regensburg; Passau; Durnstein; Vienna. From: Oceanview: $1645, Balcony: $2334. 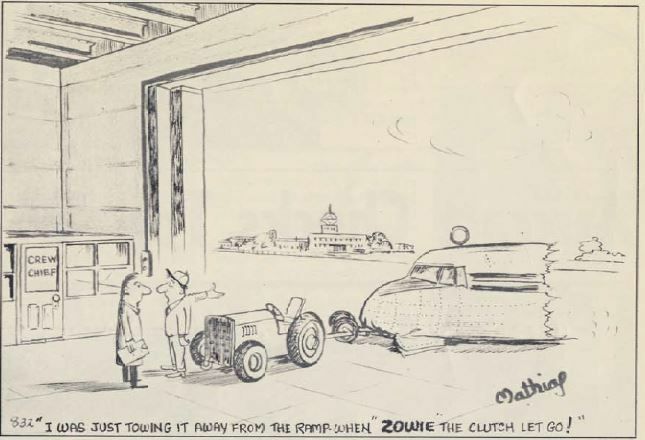 Our cartoon, by Dave Mathias, is from the "Between Ourselves" magazine issued in August 1956. 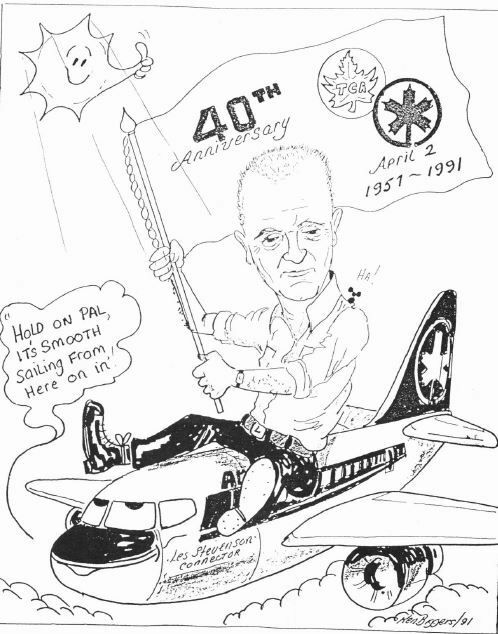 The 'smiley' in this month's issue, may be for Les Stevenson's 40th anniversary, not Air Canada's (1977) Les was a 'Lead' in YYZ stores. Cheers, and thanks for the great publication. Note: This caricature of Les was drawn by stock keeper, Ken Biggars, who contributed many caricatures to "Parts & Pieces" as well many others for various co-workers, over his career. Ken's talent and wonderful sense of humour are evident in all his work. Both Les and Ken started at YUL and had transferred to YYZ by 1980 when I started and had the pleasure of working with these two gentlemen. I would very much appreciate any news concerning their current status.